“Album.... 4(? ),” he wrote on Instagram. 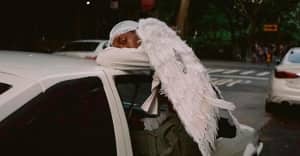 Dev Hynes, the artist behind Blood Orange, took to Instagram on Friday to share what seems to be a snippet of new music. In the clip, cars pass by his window while Hynes's voice can be heard singing over a backing track. The second part of the video features a different track with a booming drum beat. Hynes released his last Blood Orange album, Freetown Sound, in July 2016. In October, Hynes hinted that the next Blood Orange 78 percent done. Watch the preview video above.